BLACKSBURG, Va. - The Virginia Tech police officer who was gunned down in a campus attack joined the force six months after the university was the scene of the deadliest shooting rampage in modern U.S. history. He was a proud policeman who recently invited a friend to ride along with him, which made his death during a traffic stop even more puzzling. Investigators believe the gunman acted alone and that he changed clothes after fleeing the scene, then killed himself with his handgun when another officer spotted him, state police said Friday. Police are still trying to piece together a motive for the attack..
"That's very much the fundamental part of the investigation right now," State Police spokeswoman Corinne Geller told said at a news conference. The gunman was not a student at Virginia Tech, the scene of the deadliest gun rampage in modern U.S. history in 2007. Geller said investigators were confidant they know the gunman's identity but she declined to say anything more about his name, age or hometown until the medical examiner confirms his identity and next of kin are notified. State police said in a news release earlier Friday that ballistics tests confirmed Crouse and the deceased suspect had been shot by the same handgun. The tests have "officially linked the two fatal shootings," the release said. Authorities have in-car video from Crouse's cruiser that shows a man with a handgun at the officer's car at the time of the shooting. Geller laid out the most detailed account thus far of the shooting. She said Crouse had pulled over a car driven by a student and was stopped on a campus parking lot with the car in front of his cruiser. She said the driver, who she didn't name, had no connection to the shooting and has been very helpful to investigators. Crouse was sitting in his cruiser when the gunman walked up and shot him. Geller declined to say if the officer was wearing body armor or where exactly he was shot. He was not able to return fire, she said. The events unfolded on the same day Virginia Tech officials were in Washington, fighting a federal government fine over their handling of the 2007 massacre where 33 people were killed. The shooting brought back painful memories. About 150 students gathered silently for a candlelight vigil on a field facing the stone plaza memorial for the 2007 victims. An official vigil is planned for Friday night. Ironically, Crouse was killed across the street from the dormitory where the 2007 massacre that began, reports CBS News correspondent Elaine Quijano. Freshman Juliette Fielding was leaving a nearby building in the moments after the shooting and emotionally described what happened when police officers responding to the scene opened Crouse's patrol car door. "The officer in the driver's seat fell out onto the ground and when I saw his face it was covered with blood," she said tearfully. "So I knew immediately that he had to have been shot in the face or head or both." This time the school applied the lessons learned during the last tragedy, locking down the campus and using a high-tech alert system to warn students and faculty members to stay indoors. Heavily armed officers swarmed the campus and caravans of SWAT vehicles and other police cars with emergency lights flashing patrolled nearby. 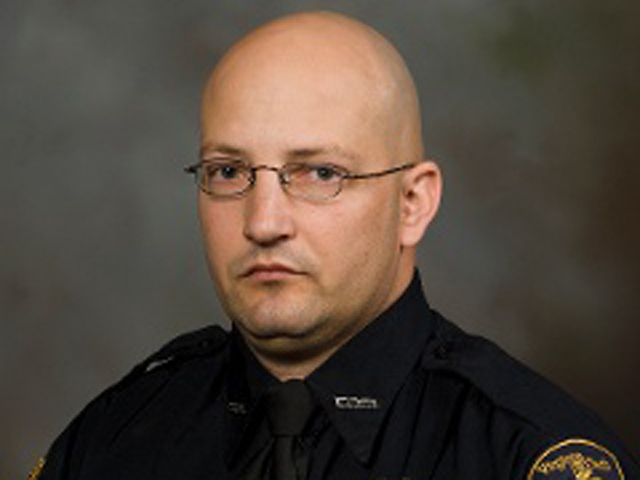 Crouse was an Army veteran and married father of five children and stepchildren who joined the campus police force in October 2007. He previously worked at a jail and for the Montgomery County sheriff's department. He was a jokester who enjoyed riding his motorcycle and rock music, his friend Aaron Proden told the AP. The two recently saw Metallica in concert in Charlotte, N.C. Crouse recently invited Proden to go on a ride-along "just to see what he does, his job, his lifestyle," the friend said. "He was a standup guy," said Rusty Zarger, a former neighbor whose two young daughters used to play with Crouse's sons at the townhouse complex where they lived. "He was very mild-mannered, very confident. You could tell he was strong in believing in himself, but very comfortable." Zarger said that after the Fourth of July, Crouse had leftover fireworks and went around the complex knocking on doors to get neighbors -- especially the children -- to watch him set them off. "He came over and got all the kids to come outside and watch it -- made it a very community thing when he didn't have to," Zarger said. A woman who answered the door at the Crouse home at the end of a three-unit townhouse building Thursday night said it wasn't a good time to talk, and they were trying to get the children to bed. A group of people were sitting around a table inside. Crouse was one of about 50 officers on the campus force, which also has 20 full- and part-time security guards. Crouse received an award in 2008 for his commitment to the department's drunken driving efforts. He was trained as a crisis intervention officer and as a general, firearms and defensive tactics instructor. The school was a bit quieter than usual because classes ended Wednesday. About 20,000 of the university's 30,000 students were on campus when the officer was shot. Exams, set to begin Friday, were postponed until Saturday. The university also its counseling center would be open all day Friday for students. "A lot of people, especially toward the beginning, were scared," said Jared Brumfield, a 19-year-old freshman from Culpeper, Va., who was locked in the Squires Student Center. White said he didn't panic, thinking instead about a false alarm involving a possible gunman that locked down the campus in August. White used an indoor walkway to go to a computer lab in an adjacent building, where he checked news reports. The shooting came soon after the conclusion of a hearing at which Virginia Tech appealed a $55,000 fine by the U.S. Department of Education in connection with the university's response to the 2007 rampage. The department said the school violated the law by waiting more than two hours after two students were shot to death in their dorm before sending an email warning, and the message was too vague because it mentioned only a "shooting incident." By then, student gunman Seung-Hui Cho was chaining the doors to a classroom building where he killed 30 more people and then himself. The school has since expanded its emergency notification systems. Alerts now go out by electronic message boards in classrooms, by text messages and other methods. Other colleges and universities have put in place similar systems. Andrew Goddard, who has crusaded for stiffer gun control laws since his son Colin was wounded in the 2007 shootings, said Virginia Tech's response seemed substantially better this time. "It sounds like things moved very, very fast this time as opposed to the time before," said Goddard, whose daughter and nephew go to the school. "That doesn't surprise me. Virginia Tech really did get the message in the sense that when bad things are happening, you have to ask quickly." "It just brings up a lot of bad feelings, bad memories," said O'Dell, who was at his home a couple of miles from campus at the time of the shootings. "At first I was just hoping it was a false alarm," he said. "Then there were reports of two people dead, and the second person shot was in the parking lot where I usually park to go to school, so it was kind of surreal."